Take a flight to the Nuremberg Airport and continue your journey by public transport. The U2 subway line directly connects the Nuremberg Airport with the central train station in Nuremberg in just 12 minutes. Then it takes about 1.5 hours to get to Coburg by train. The Campus Friedrich Streib offers an impressive view of the historic old town of Coburg and the Fortress Coburg. Three quarters of our students are at this campus and study in the fields of natural sciences and engineering, social work and health as well as business administration. The university administration and the central administration have their headquarters here. The first buildings on Campus Friedrich Streib were dedicated and opened on May 20, 1960; they were from the predecessor of the university, the State School of Construction. The first student dormitory was built in 1961. In the following decades a modern university campus with lecture halls, seminar rooms, offices, laboratories and workshops developed. The campus currently includes five student dormitories with a total of 506 rooms and apartments. 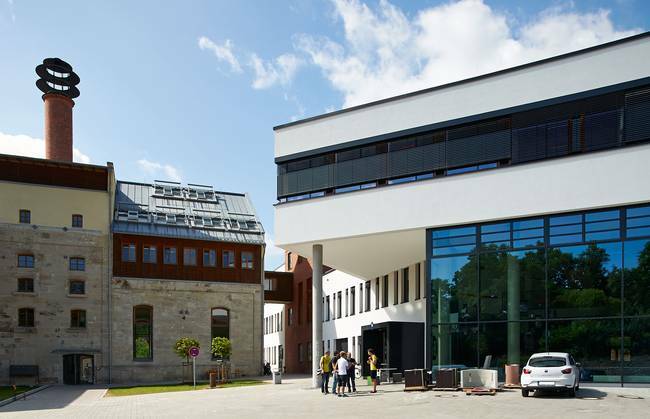 In the coming years, the Campus Friedrich Streib will continue to develop. By 2021, the Free State of Bavaria will invest more than 60 million euros in an IT and Media Center, in laboratories and test benches, as well as in a parking deck and in the refurbishment of existing buildings. Take the pedestrian underpass to exit the train station at the rear. The steps at the end of the underpass lead you up to the sidewalk that runs parallel to the highway. Go straight until you reach the first road to the left (Rummental). Cross this street and continue up the small winding street parallel to the highway (Gabelsbergerstraße). In about 400 meters this street leads you directly to the grounds of the university. You will be at the back entrance between the main auditorium (on your left) and the lecture halls (on your right). This will take you between 10 and 12 minutes. From the south: On the expressway A 73 take exit number 11 (Untersiemau / Coburg-Süd), which leads to state road B 4. Follow B 4 to Coburg, take the exit Weitramsdorf / Hochschulen and follow the signs for the Hochschule from there. From the north: On the expressway A 73 take exit number 7 (Coburg/Bad Rodach) to state road B 4. On B 4 take the exit Weitramsdorf / Hochschulen and follow the signs for the Hochschule from there. From the west: Take state road B 303 and then B 4 towards Coburg. On B 4 take the exit Weitramsdorf / Hochschulen and follow the signs for the Hochschule from there. From the east: Take state road B 303 and then B 4 towards Coburg. On B 4 take the exit Weitramsdorf / Hochschulen and follow the signs for the Hochschule from there. The Campus Design is home to the Department of Design with its bachelor's and master's students in the fields of architecture, civil engineering, interior design and product design. The core of the campus is the historic Herzogliche Hofbrauhaus (Ducal Brewery) near the center of Coburg. After this building was refurbished, the interior architecture and integrated product design programs moved into it in winter semester 1999/2000. 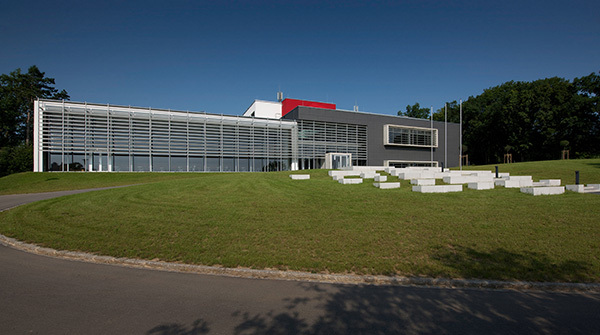 In summer semester 2012 new buildings with space for teaching and research as well as with a branch library and a canteen were added. On the Campus Design there is also a student dormitory with 106 apartments. Exit the train station through the front exit labeled “Innenstadt” (city center). Turn right and follow this street (Lossaustraße) for about 350 meters. You will come to a three-way intersection; follow the intersecting street to the right and walk past (but not through) an underpass. As the street continues, it is called Sonntagsanger. Follow Sonntagsanger for ca. 750 meters and you will approach a large red brick bridge. Take the steps up the bridge, and from there you can see the large building with the words Hofbrauhaus Coburg on it. Continue to this building. This will take you around 20 minutes. From the south: On the expressway A 73 take exit number 11 (Untersiemau / Coburg-Süd), which leads to state road B 4. Follow B 4 to Coburg. When you enter the city B 4 reduces to a two-lane road. When you approach a large red brick bridge over B 4, take the exit Co-Wüstenahorn onto the bridge. (From this point you can see your destination: a large white stone building on your left with the words Hofbrauhaus Coburg on it.) At the end of the exit turn left onto the bridge and then right at the traffic light at the end of the bridge. Immediately take another right and enter the parking lot behind the Hofbrauhaus. From the west: Take state road B 303 and then B 4 toward Coburg. When you enter the city B 4 reduces to a two-lane road. When you approach a large red brick bridge over B 4, take the exit Co-Wüstenahorn onto the bridge. (From this point you can see your destination: a large building on your left with the words Hofbrauhaus Coburg on it.) At the end of the exit turn left onto the bridge and then right at the traffic light at the end of the bridge. Immediately take another right and enter the parking lot behind the Hofbrauhaus. From the east: Take state road B 303 and then B 4 toward Coburg. When you enter the city B 4 reduces to a two-lane road. When you approach a large red brick bridge over B 4, take the exit Co-Wüstenahorn onto the bridge. (From this point you can see your destination: a large building on your left with the words Hofbrauhaus Coburg on it.) At the end of the exit turn left onto the bridge and then right at the traffic light at the end of the bridge. Immediately take another right and enter the parking lot behind the Hofbrauhaus. From the north: On the expressway A 73 take exit number 7 (Coburg/Bad Rodach) to state road B 4. Follow B 4 in the direction of CO-Süd-West-Centrum, and take the exit CO-Ost / Campus Design at a large brick bridge over B 4. The exit curves to the right and ends at a traffic light. (From this point you can see your destination: a four-story white stone building on your right.) At the traffic light continue straight across the road. Then take an immediate right turn and enter the parking lot behind the Hofbrauhaus.